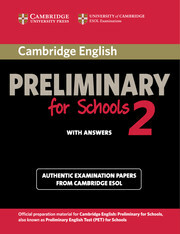 Cambridge English Preliminary for Schools 2 contains four complete and authentic examination papers for Cambridge English: Preliminary for Schools (PET for Schools). This collection is aimed at a young audience, and provides the most authentic exam preparation available. They allow candidates to familiarise themselves with the content and format of the examination and to practise useful examination techniques. This book contains a clear explanation of marking and grading, authentic sample answers, a comprehensive section of keys and recording scripts, and frameworks to help with thorough preparation for the Speaking test. Audio CDs containing the exam Listening material, a Student's Book without answers, and a Self-study Pack containing the Student's Book with answers and Audio CDs are available separately. 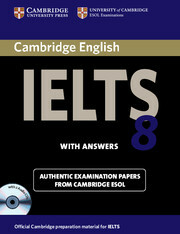 Cambridge IELTS 8 contains four authentic IELTS papers from Cambridge ESOL, providing excellent exam practice.